Last October 10, 2015 the Diocese of Pasig held the 3rd Pasig Catholic Mass Media Awards. Among the winners was Communication Foundation for Asia and Family Matters TV’s special production “Mga Pastol sa Sabsaban (Pagninilay Para Sa Pagdalaw Ni Pope Francis)” under the category Best Long Film. “Mga Pastol sa Sabsaban” reflects upon the recent visit of Pope Francis. It explores the idea on “What would you tell Pope Francis if you had the chance?” The video special stars two students — Vonn (played by Lance Raymundo) and Dorcie (Jamie Jalandoni) who interviewed ordinary citizens of different social standings about what personal statements they would share with the Pope, were they to have a one-on-one with him. Along the way, Vonn and Dorcie reflect on the answers they get, and how these relate to the teachings of Pope Francis. The Pasig Catholic Mass Media Awards was established on 2012 to give credit to those who use their God given talents in social communications to proclaim the good news. Communication Foundation for Asia thanks PCMMA for the honor. T;he second installment of CFA’s “Church of the Poor” forum series is set for April 22, starting 9am. Venue is CFA’s Lagerwey Hall, 4427 Old Sta. Mesa, Manila. This time, discussions will focus on “Priestly Renewal in the Church of the Poor,” with the Second Plenary Council of the Philippines (PCP II) as the take-off point. Fr. Catalino Arevalo, SJ, is the principal speaker in the forum. To register for the upcoming forum, contact Me-Ann, 713-2971, or Yani, 713-2981 Ext 184. Or E-mail training@cfamedia.org. 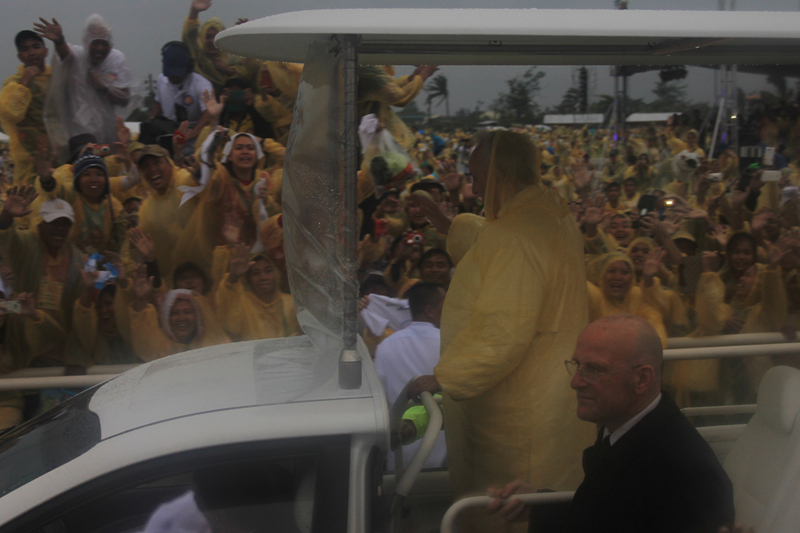 CFA was able to capture the Pope’s mass on Tacloban airport amid heavy rains and strong winds. It was a humbling experience as the large crowd of more than half a million endured the weather and cold just to have a glimpse of the Pope. A large part of the crowd even waited for the pope as early as the day before. The scene was both inspiring and emotional as Pope Francis was able to comfort the survivors of typhoon Yolanda and the earthquake in the Visayas. Pope Francis showed sympathy and provided words of comfort and encouragement to everyone during the mass. It brought the crowd to tears as they felt the true meaning of the Pope’s visit. To reap the pastoral, theological and spiritual fruits of the visit of Holy Father, Pope Francis, the Communication Foundation for Asia (CFA) will host a dialogue and reflection with visiting Missionary of the Sacred Heart, Fr. Diarmuid O’Murchu on “Pope Francis, the Church of the Poor and the Consecrated Life in the Light of the Spirituality of the Heart.” The dialog will also feature three representatives from the poor sectors of peasants-farmers, urban poor-workers and the indigenous Filipinos, clergy, religious, lay and the ecumenical community. 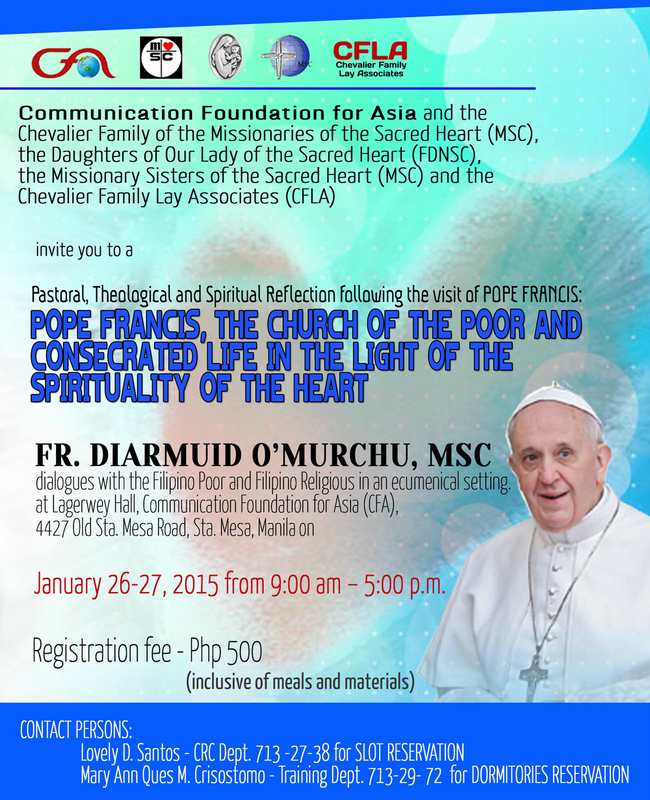 Co-sponsored by the Chevalier Family of the Missionaries of the Sacred Heart (MSC), the Daughters of Our Lady of the Sacred Heart (FDNSC), the Missionary Sisters of the Sacred Heart (MSC) and the Chevalier Family Lay Associates (CFLA), this dialogue and reflection will take place on January 26-27, 2015 from 9:00am to 5:00pm at the Lagerwey Hall, Communication Foundation for Asia (CFA), 4427 Old Sta. Mesa Road, Sta. Mesa, Manila. Highlights of the dialogue and reflection will be topics on Pope Francis and his thoughts on the Church for the Poor, the Philippine Catholic Church’s Year of the Poor, the Universal Church’s Year of Consecrated Life and the Spirituality of the Heart. A registration fee of PhP 500 will be charged to cover snacks, meals and reference materials. Jeanne Diquit, an artist in CFA’s Publications Department, was test-driving her new iClone animation software. She thought what better way to do it than to create an animated clip of Pope Francis, in time for the Holy Father’s visit to the Philippines? To view her output (in low resolution), click here. What would you tell Pope Francis if you had the chance? This is what the Communication Foundation for Asia and Family Matters on TV explore upon in the upcoming reflective docu-drama special “Mga Pastol sa Sabsaban: Pagninilay Para Sa Pagdalaw Ni Pope Francis”. In this video special, two students — Vonn (played by Lance Raymundo) and Dorcie (Jamie Jalandoni) — partnered to do a social research project. With the upcoming Papal visit as Mga Pastol sa Sabsaban 2 inside pictheir focal point, they interviewed ordinary citizens of different social standings about what personal statements they would share with the Pope, were they to have a one-on-one with him. Along the way, Vonn and Dorcie reflect on the answers they get, and how these relate to the teachings of Pope Francis. Mga Pastol sa Sabsaban was written and directed by Pie Mabanta-Fenomeno, head of CFA’s Electronic Media Department. The premiere telecast will air on TV5 this Saturday, January 10 at 5:30AM and will be replayed on Sunday, January 18 at 5:00AM. It will also air on Studio 23 on January 10 and 17 at 5:00AM as a two-part special. Airings on TV Maria and the Knowledge Channel will be from January 12-16, at time slots to be announced soon.